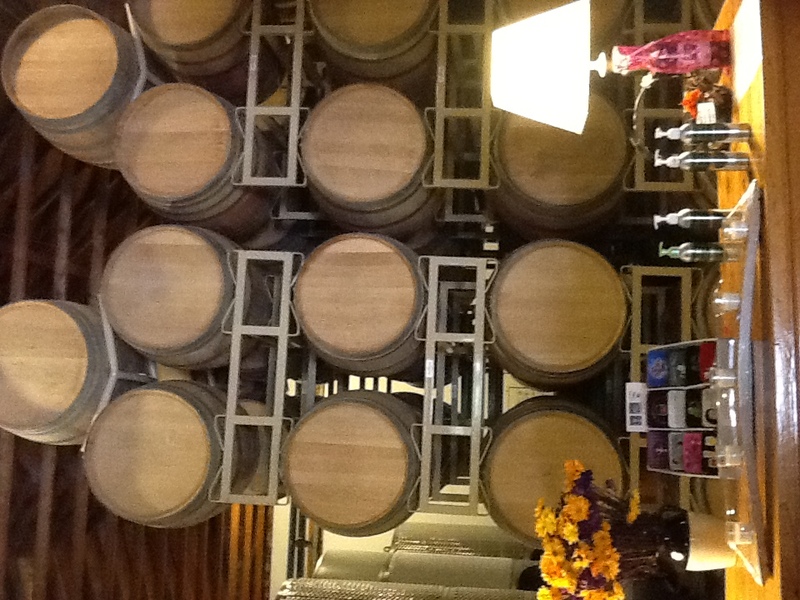 Welcome to the Hart Family tasting room. Hart Family Winery Is a long way from Napa. Really. It’s in Temecula, about 500 miles away in the rolling hills of sunny Southern California. This pretty little town has a little bit of everything, from palm trees to cowboy bars. What it doesn’t have is Napa’s slick, corporate feel. 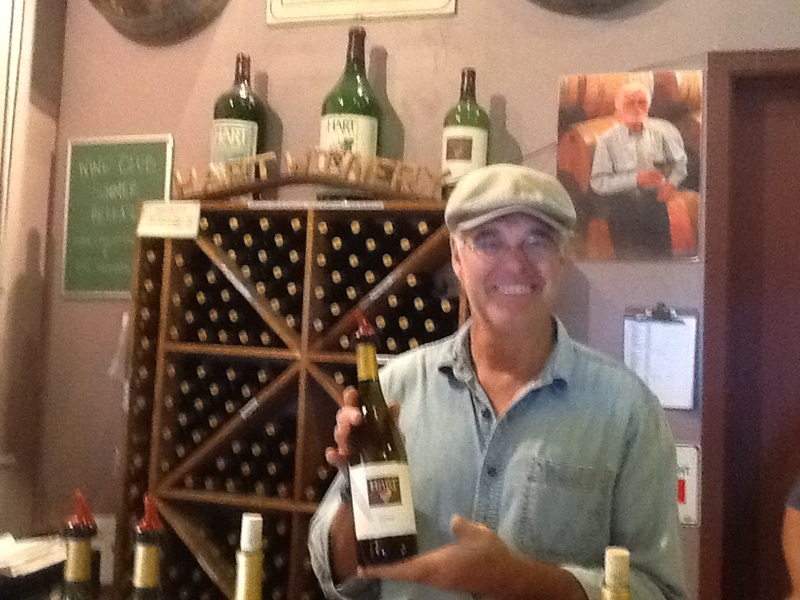 Hart Family Winery reminds me of Napa 20 years ago, when tasting rooms were just set-ups in a working winery, the owner/winemaker was leaning on a barrel chatting with guests, and the passion of everyone in the room was abundantly evident. When we walked through the door at Hart Family, the party was in full swing. Not only was founder Joe Hart chatting away by the tasting bar, but assistant winemaker Daniel Denison was pouring behind it. Dennis filled us in on the unique features of the Temecula AVA. Like its northern counterparts, the Temecula AVA sits less than a mile from the cool Pacific Ocean. But down here south of Los Angeles, there is no cooling fog layer like up in Sonoma County, or brisk afternoon breezes like in Paso Robles. The temperatures here climb to 90 or so during the day, but don’t drop much below 70 at night. That’s not much of a diurnal temperature shift, and that temperature shift is one of the key factors in creating structure in wine grapes. Here's Daniel Denison, with a photo of Joe Hart looking over his shoulder. Here’s how Dennis put it: “Our main challenge here is to maintain acid levels and control sugar levels. We don’t want overly “jammy ” wines.” Careful canopy management (pruning or shaping the leaves on the vines that shade and protect the grapes) helps mitigate summer heat. Irrigation is also necessary in the dry climate. So what about those wines? We were very pleasantly surprised by a wonderfully snappy Sauvignon Blanc (Hart Family Temecula Valley 2012) that showed just a hint of grapefruit along with a nice core of juicy apricot. It apparently sees a bit of oak, but it’s not obvious except in the slightly rounded mouth-feel. I thought the winemaker did a great job of balancing fruit and acid. 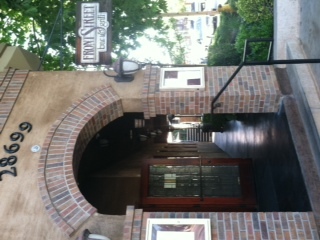 Downtown Temecula has a small-town feel. We made our way through a series of red Rhone varietals, which along with Mediterranean varietals have become the favored grape varieties for Temecula’s Mediterranean climate. My favorite was the 2010 Hart Family Vineyard Syrah, which offered soft berry flavors and an almost Pinot-like mouthfeel. It was fruity (but not jammy), and the velvety finish showed just a hint of white pepper to keep it lively.